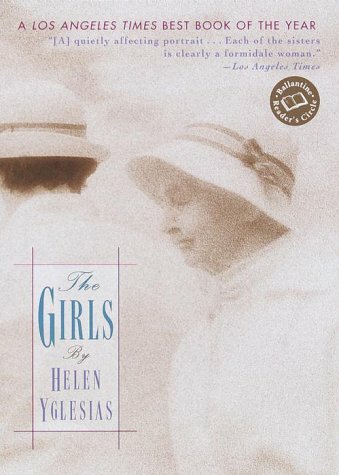 Publisher: Ballantine Books, Westminster, Maryland, U.S.A.
Helen Yglesias has been uniformly praised by reviewers of her previous novels for her unerring sense of character, her elegance, delicacy, and humor, her consummate craftsmanship, and her incomparable ear for dialogue. All these qualities are fully on display in The Girls, the story of four sisters in their eighties and nineties. As the novel begins, Jenny, the "baby" at eighty, has flown to Miami--that fantastic mix of generations and ethnicities--to care for her two oldest sisters, Eva and Naomi, who are frail and failing. The third sister, Flora, eighty-five, is an extravagant personality with not much of a head for the hard practical decisions facing Eva and Naomi, though she does a priceless standup routine on the Miami senior circuit. Contemporary fiction, like the movies, shows us almost nothing about the lives of the old, and especially old women, who, if they appear at all, are either kindly grandmothers or crones. Yglesias's great achievement in The Girls is to give us four beautifully realized women just like everyone else, with all their pettiness and foibles and passions and nobility, intent on life even as life ebbs, as eager for the next joke or glass of wine or love affair or trip to the mall as any teenager. "Why can't love last forever?" Jenny asks herself as she thinks back on the past. "Why can't we live forever?" The plot of The Girls is simple. What will happen to Eva and Naomi? Will they or won't they have to go to a nursing home? Not much suspense there, and one compelling point of the story is to dramatize the cramped and visionless options our nation has devised for the keeping and hiding of the old. But that isn't the main interest of the book, which lies in Jenny's unflinching gaze, at her sister's old age and her own. Without shrinking from the infirmities of age, Yglesias always finds the humor and humanity in her characters and their dilemmas. Why should anyone want to read a book about four old ladies? Well, for that matter, why should anyone want to read a book about a big white whale? It's all in the telling, and The Girls is exquisitely told, by a master. Moreover, it is a book that will strike a resonant chord with the huge generation of baby boomers now watching their parents and older relatives face the challenge of aging with dignity. We live, we grow old, we die. It's natural, it's as it should be, and yet Jenny's question rings out: Why can't we live forever? The Girls does not answer that question, it only poses it, as the finest fiction does, and leaves it echoing hauntingly, beautifully, in the mind.